CHESTNUT HILL, Mass. 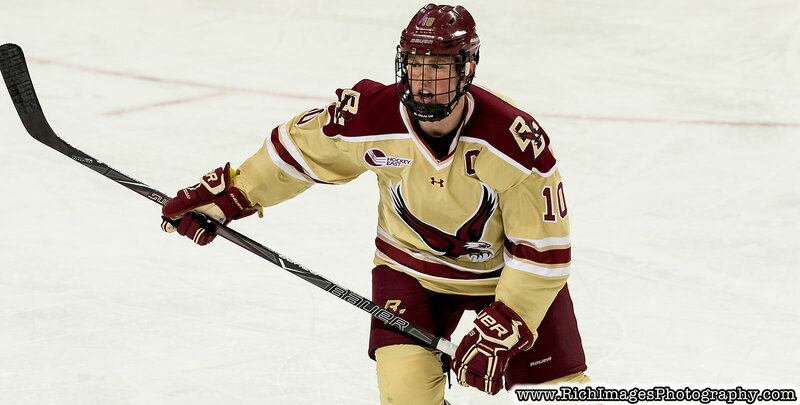 - Christopher Brown scored a pair of goals, including a penalty shot in the third period, leading Boston College to a 4-1 Hockey East victory over 10th-ranked Providence on Saturday afternoon at Kelley Rink. The win clinched the regular season series for the Eagles, who beat the Friars 4-2 last Friday night on the Heights. BC improved to 8-3-2 in the league and 8-11-2 overall. David Cotton netted his team-leading 14th goal of the season during a shorthanded situation in the first period, and Christopher Grando collected his first of the year to provide insurance in the third. Following Grando's goal, The Eagles were forced to kill off 1:45 of 5-on-3 power play time for Providence. In the closing seconds of the kill, Brown was sprung on a partial breakaway before being hooked by Ben Mirageas from behind for a penalty shot, which the senior buried on a backhand deke. It was BC's first successful penalty shot since Austin Cangelosi scored against Air Force in the 2017-18 season opener on Oct. 7, 2016. Joseph Woll made 25 saves in the Boston College net. Providence lost for the third time in four games, falling to 13-7-4 (6-5-1 HEA). The Eagles face UMass Lowell in a home-and-home series next weekend, beginning on Friday (Jan. 25) at Kelley Rink for a 7 p.m. faceoff.